The copy command lets you copy a scene's content over to another existing scene. You can choose to copy all of a scene's data, or only its exposure sheet. IMPORTANT This will overwrite the target scene with the content of the source scene. Select the environment and the job from the Control Center window. From the top menu, select Scene > Copy. Right-click anywhere in the Scenes list and select Copy. The Copy Scene dialog box appears. 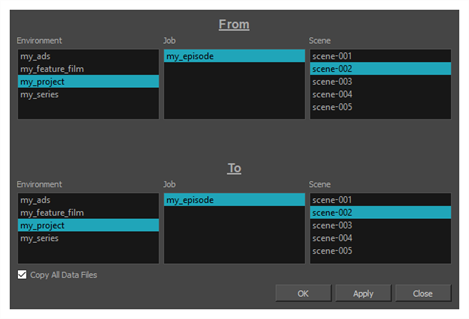 In the From section, select the scene to copy by selecting its environment, its job and then the source scene. In the To section, select the scene to overwrite with the selected scene by selecting its environment, its job and then the target scene. If you want to copy all of the source scene's content over the target scene, check the Copy All Data Files option. If you only want to copy the source scene's Xsheet over to the target scene, uncheck this otpion. If the scene you are copying to already has an exposure sheet, a confirmation dialog box appears to verify that you want to overwrite the target scene's data. If you are only copying the source scene's Xsheet, this will only overwrite the target scene's Xsheet. If you are copying all of the source scene's data file, this will overwrite all of the target scene's data files. Click Yes if you want to copy over the existing scene. Click No to cancel or to select a different target scene. The data in the source scene is copied over to the target scene. You can open the target scene in Harmony to verify that it contains the source scene's data.